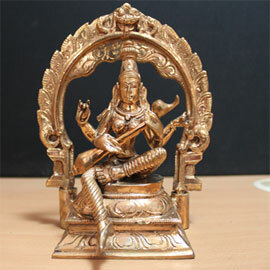 Place this statue of Goddess Saraswathi on your altar to enhance intelligence and bestow divine wisdom. This 6-inch tall statue is exquisitely crafted and will be energized in a Fire Lab before being sent to you. It is made of 5 metals to absorb and retain the positive energy generated from the ritual. The Yogis claim that the 5 metals serve as the perfect medium to hold and retain divine, cosmic energy. Strengthen your relationship with the Goddess by making regular offerings of candle, incense, water, and food to her. The subtle essence of these offerings will be absorbed by the statue, and according to scriptures, will make it to come alive. Dr. Pillai also recommends pouring water over it, along with milk and orange juice if you are able. You can then offer your prayers to the Archetype through the statue, and invite her blessings into your life.